The brief 2016 two-day racing meet at the Du Quoin State Fair gets under way Saturday afternoon with a 12 noon first post. In yesterday’s column I reviewed the seven ICF championships to be contested today, so let’s take a look at the last five state-bred pari-mutuel finals which will be decided Sunday afternoon, races six through eleven. Peter Karras’ Fox Valley Charm was much the best in the Springfield championship and she should be an overwhelming favorite to add the Du Quoin title to her list of accomplishments when she takes on the Incredible Filly and Perched On Top, the third and fourth place finishers in that race, along with Mystical MJ. Casey Leonard is back in the bike behind Fox Valley Charm who races out of the barn of Rodney Freese. Unlike the mare division, the male category is very much a toss-up with a field comprised of Cole Heat (Ridge Warren), in from Hoosier Park, Springfield champ Dinky Dune (Pat Curtin), Citizen Kane (Jared Finn), recent Hawthorne Open Pace winner Fiveknuckleshuffle (Bobby Smolin), and Springfield runner-up Dixie’s Box (Casey Leonard). 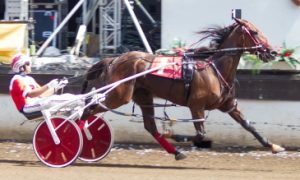 Cole Heat has been taking on some rugged open company horses in Indiana and the Ray Hanna trained 6-year-old is the only horse in the race ever to win under 1:50 doing so with a 1:49.4 mile last year at Balmoral. Cole Heat may be asked to play try and catch me and Dinky Dune could get a two and three-hole trip and do just that. Fiveknuckleshuffle could battle Cole Heat for control or he might seek and get the pocket this time. I would have been great to see if Gabe Henry could avenge his loss in Springfield to Fox Valley Inferno but the draw didn’t work out that way. Instead Gabe Hall (Todd Warren) in in the first division and with the rail should get to the top and start a new winning streak after his five race string was snapped at Springfield. The Tom Graham Jr. trained home-bred earlier swept through the first three legs of the Carey Stake Series and has his sights set on the $100,000 Final on Hawthorne’s Night of Champions on Sept.10. Tiny Jim (Dale Hiteman) was hurt by a sluggish start at Springfield and he’ll have to avoid another to get the job done in this division. The Joel Smith trainee has finished worse than third only once in seven career starts. Fox Valley Reggie (Freddie Patton Jr.) was shuffled out of contention at Springfield and did finish full of pace, He could get a spot up-close in the early going again and do more with the position it this time. With a very favorable post shift from the six-post at Springfield to the rail at Du Quoin Trixie’s Jethro (Jared Finn) is in a sweet spot to resume his earlier winning ways for the John D Finn Stable. The Charles Doehring home-bred gelding had to battle through the first three quarters at Springfield and didn’t have enough left in the tank to hold off the winner Polar B, absent at Du Quoin, and runner-up Louscipher. Trixie’s Jethro should get control in good shape Sunday and that will make it difficult for his seven foes to pull off an upset. Louicipher, who has been first or second in 8 of his 10 freshman starts for trainer Roshun Trigg, drew the two-slot and driver Jamaica Patton would love to get a pocket trip behind the likely heavy favorite and he may do just that. The luck of the draw can play a big part in any stake race and it just might in this ICF sophomore stake. Royale Rose (Matt Krueger) and Dan D Dune (Casey Leonard) switch starting positions for tomorrow’s Du Quoin stake. Royale Rose had the seven at Springfield and now has the one. Dan D Dune had the rail and now has the seven. The draw also went much better for Goinduneside who broke leaving from the eight at Springfield and now has the five with Lewayne Miller who will come in from Indiana to drive him Sunday. Springfield champion BS Tyriffic didn’t make the trip to southern Illinois but Caffeine Kid (Dale Hiteman), second best at that State Fair did and he again drew the two-slot where another up-close journey might be in the works.